Meditation is proven to reduce stress, improve sleep, enhance self awareness & promote emotional health. So why aren’t more of us practicing it daily? I was first introduced to meditation in my yoga teacher training in 2016. I learned 3 key points that encouraged me to explore different types of meditation and work it into my daily routine since graduating. The idea of meditation can seem overwhelming, intense and it carries stereotypical weight. Before I walked into meditation training, the vision in my mind when I thought of it was a man sitting cross legged for hours somewhere tropical. But I had also heard of many successful people, mentors, and teachers finding incredible benefits from this practice. So I walked into class that day with an open mind and open heart to what I could learn. These 3 key ingredients stand out to me and helped me build my meditation practice- explore various types until you find your meditation match, know you don’t have to be in easy sitting pose to mediate and remember it takes practice! I remember feeling overwhelmed when reading the various types of meditation. Some included mantras, others focused on mindfulness elements, walking meditation, chanting, vibration or sound, morning meditation, etc. So where do you start? The first three types that I practiced were guided, sound and mantra. I suggest you try one each day for 5-10 minutes. After those three days, reflect back on which type of meditation felt the best. Which would you be more willing to try again? All three variations can be found on Google, YouTube, and various local classes, including In Fine Feather Yoga. Guided meditation is a voice leading you through either by recording or in person. It’s helpful to stay focused on the present moment and voice with this tool as well as providing you the chance to explore various topics covered in guided meditations, like gratitude or relaxation depending on the recording or class. Sound meditation quickly became one of my favourites. A bell or singing bowl is often used in classes or recordings to provide a guide to come back to the present moment when the mind gets distracted. I found this type of meditation to be simple and relaxing. Mantra meditation is the practice of chanting or repeating a word/phrase out loud that holds meaning. It gives the mind something to focus on when it would normally get distracted. “Om” is known to be the most basic and powerful mantra. Many chose to combine the words “Om” and “Shanti” as it means peace in Sanskrit. It can be repeated as many times as you’d like or followed along with a recording. Contrary to belief, easy sitting pose isn’t the only way to meditate. Traditionally yoga was practiced first, followed by meditation because it prepared the body to sit for a longer period of time. With this in mind as a beginner, it’s really important to take time to find a comfortable position. That could be seated against a wall to support the spine, laying down, using blocks to support the knees, sitting on a meditation cushion, hand weights for grounding, etc. The more often you practice in a seated position, the better your posture will get and the quicker you’ll find yourself relaxing. Lighting candles, using essential oils, or soft lights are not necessary but can help to create a more relaxing environment wherever you chose to mediate. What I believe is so powerful about this practice is that it can be done anywhere for any length of time and you are bound to feel better afterwards. Whether that be 5 minutes in your car on your lunch break, 10 minutes in the morning before the kids wake up, or after your yoga class. I could give you a list of meditation techniques or what my meditation practice looks like. But at the end of the day, you just need to start. Even if you sit for 5 minutes. Build from that number and eventually it’ll be 10 minutes, than 15 minutes. We scroll our phones or watch numerous TV commercials in that same span of time. It’s a choice and a commitment we must make to ourselves. The long term benefits are worth the time put into practice! You may feel more immediate benefits like stress relief, less anxiety, body awareness, lower blood pressure and/or better focus. My favourite app to support my meditation practice is the Insight Timer which offers lots of resources, guided meditations, a timer with a sound/bell tool as well as a tracker to motivate you! You can find me leading the Saturday morning Intro to Meditation class at 11:15-11:30am with a $5 drop-in. Additionally, we are hosting classes on Thursday and Sunday mornings at the same time. Check out the schedule HERE. These classes are designed to teach students how to sit comfortably, breath deeply, release the body & still the mind. Each week we'll explore new methods of meditation, some with full guidance and some in silence. Meagan is a graduate of the In Fine Feather Yoga 200 Hour Teacher Training Program and the assistant manager at the studio. 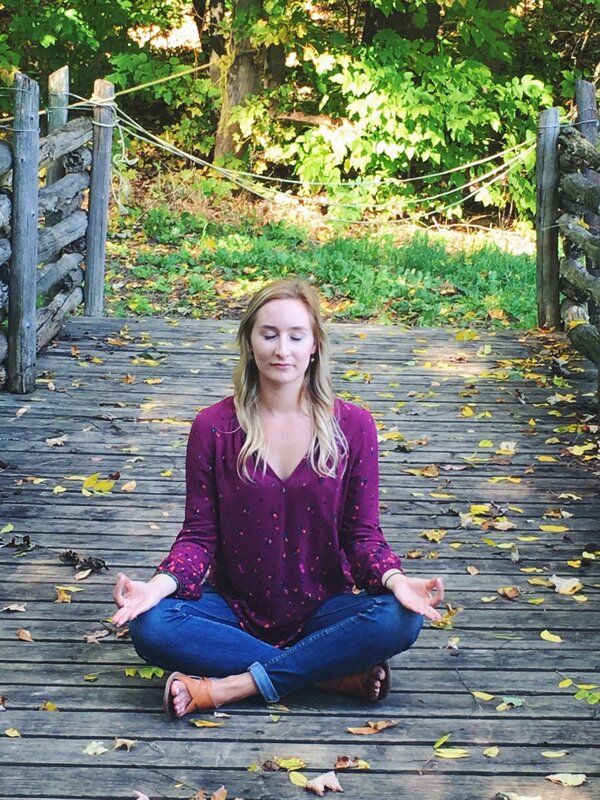 Check out her blog post where she shares her IFF Yoga Journey. Come meet Meagan on the mat at In Fine Feather Yoga in Hamilton! Check out her bio HERE and find her on the class schedule HERE.